Organic Well Being: Are Your Candles Emitting Toxins? Candles are great for encouraging relaxation and creating a calm, serene environment. A candle’s aroma and soft, warm glow sets a nice tone for romance, sophistication, and tranquility. Most candles today feature a variety of aromas. While refreshing they may be, the chemicals used to produce those fragrances can be toxic and can contribute to air pollution. Fortunately, there are safe options, and it's just a matter of being conscious during your purchasing decisions. Let's take a quick look at the components of many candles, and how each component may be contributing to a toxic environment. Cored wicks are usually cotton around a paper or metal core. Zinc, tin, and lead are standard compounds used in its composition. Burning candles with lead-cored wicks is now known to cause lead poisoning, and there are similar concerns about zinc-cored wicks. In 1974, the National Candle Association of the U.S. voluntarily stopped using lead-cored wicks because of risks with airborne lead. Unfortunately, many countries outside of North America still produce candles using dangerous wicks. In 2000, the Public Citizen’s Health Research Group published a study in the Journal of the American Medical Association that indicated that candles with wicks containing lead were available at 12 different stores in the Washington-Baltimore area. Testing showed that the candle containing the least lead would, during three hours of burning time, produce enough air lead concentration so that a normally active six-year old would exceed the recommended daily lead limit for children in 45 minutes. The authors concluded that there is no reliable method to distinguish lead-containing wicks from other metal-cored wicks. Fragrance oils are specially made for particular uses, such as scenting candles, soaps and cosmetics, or potpourris. They are usually synthetic. Exact formulas for fragrances fall under the trade secrets act in the U.S., but manufacturers of the oils will normally be able to produce a Materials Safety Data Sheet which will cover the physical characteristics of the oil, physical or health hazards, and first aid treatment in case of an accident. 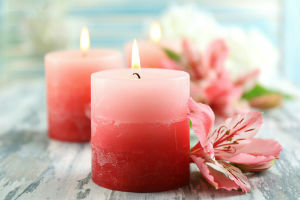 Candle scents contain stabilizers and fixatives which allow the oils to mix with wax and give off an aroma when heated. Essential oils are naturally-occurring oils that are extracted mainly from botanical sources. They are usually more expensive than synthetic fragrances, and may not blend well with candle wax. They are more volatile than synthetics and most of them are difficult to use in candles unless they have added stabilizers or fixatives. When candles are lit, they emit these chemicals into the air, the air we breathe. Our bodies take the burden of this indoor air pollution, with unknown toxic effects. The American Lung Association even warns people from burning scented or slow-burning candles that contain artificial ingredients. In addition, they suggest burning beeswax candles instead with metal in the wick, or candles that are greasy to the touch. Buy candles from trusted countries. Imported candles often come from countries where they employ chemicals no longer used in North America because of health concerns. Find out what the wick is made of. If your vendor can’t tell you, don’t buy it. Cotton or hemp wicks are considered to be the safest. Choose candles made from beeswax or soy wax. Avoid paraffin. Be aware that many candle manufacturers make claims for their candles or waxes that can’t be substantiated or are untrue. No candle is “soot-free” because combustion causes soot; however, beeswax and soy wax don’t produce sticky, black, petroleum-based soot. The post Are Your Candles Emitting Toxins? appeared first on Dr. Group's Natural Health & Organic Living Blog. Yes, I eat croissants on vacation… I am human! I bet you ate this as a child too. Check Out Dr. Group on Hulu! This 90 second video could change your life. This little habit is so effective! Very very very good news. Yes very!